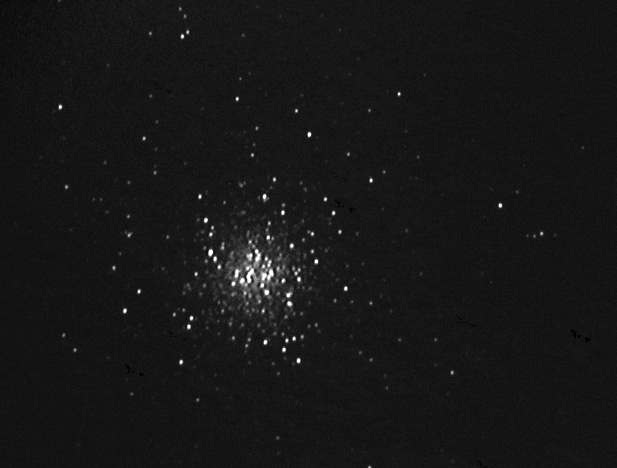 Adrian Brown took the following image of the globular cluster M53 in Coma Berenices on the 10th April 2005. He used a Celestron C11 at F3.3 and an ATK-1C camera. The image is a composite of 8 thirty second exposures stacked in K3CCD Tools and the image was dark frame adjusted to remove 'hot' pixels. Final processing was performed in Photoshop to convert the image to greyscale and remove some background sky glow.